← “Harvest” Your Dining Options! Think about all the kinds of paper that you deal with on a daily basis: the smooth white copy paper you print your mid-terms out on, the copies of the DP stacked high in the Quad entrance, the dollar bills in your wallet. Paper generally serves the most basic functions in our lives that we can forget that it’s a thing – an actual object. Consider the Van Pelt-Dietrich Libray, arguably one of the most paper-filled buildings on campus. But there’s a different kind of paper you’ll find in the library these days…paper that is for pure, beautiful decoration. Paper that is art. Now on display in the Kamin Gallery (on the way to the Weigel Information Commons) is a super cool art exhibit, Paper: A Deckled Edge by Philadelphia artist Lesley Haas. She uses natural fibers and pigments to hand make paper, which she then fashions into rustic sculptures and wonderfully textural 2-dimensional pieces. The “deckled edge” referred to in the show’s title is the raw, unfinished edges of her paper, which gives the pieces a natural, almost antique quality. Next time you’re in the library and can’t look at a computer screen or a book for one more minute without going crazy, take a few minutes to wander through the gallery and let your eyes rest on the elegant colors and shapes. A little time spent with art can help to rejuvinate your mind, and give you new energy to tackle your work. Paper: A Deckled Edge is up through Februrary 15, 2013. 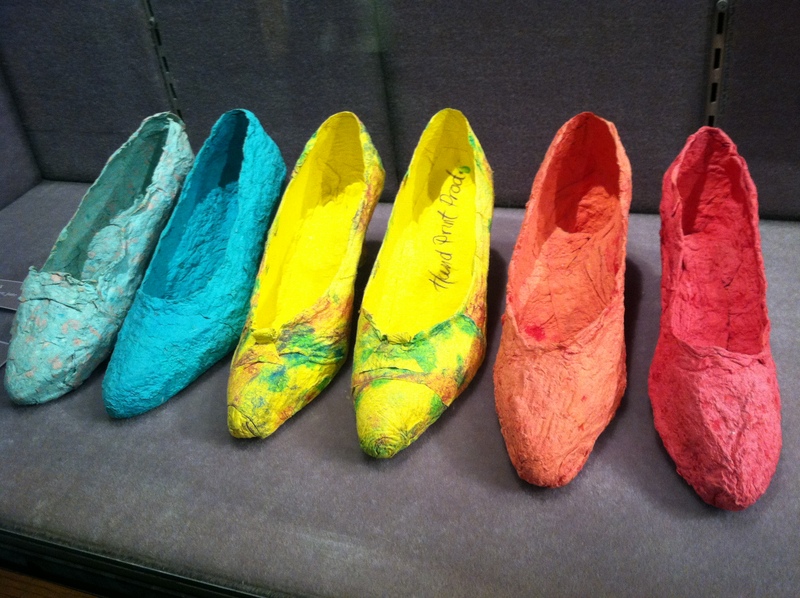 This entry was posted in Campus Resources, UPenn fun and tagged art, Lesley Haas, Library, paper, UPenn, Van Pelt. Bookmark the permalink.